KUALA LUMPUR: Under-the-table corruption should be detected and prevented from becoming above-the-table corruption, said former prime minister Tun Dr Mahathir Mohamad. Dr Mahathir said, as a person who led the country for many years, he found from his own analysis that there were two stages of corruption. “There are the under-the-table corruption and above-the-table corruption,” he said at the second annual Malaysia’s War on Corruption Symposium, here, yesterday. He said under-the-table corruption occurred when a corrupt official knew that it was wrong and a crime to commit such an act, thus he committed it in private without others knowing about it. “If this is not corrected, above-the-table corruption will take place where it becomes a fact of life, something that happens and you accept it. “You do not have to fight it because everybody is giving and everybody is receiving and you even have special rates…for this job you give this much and for that job, you give that much. “When this situation happens, corruption will become even greater because everybody along the line will be getting his share of the bribe. ministers and ministers. Everybody is receiving and there is no one to say you are doing something wrong or illegal,” he said. 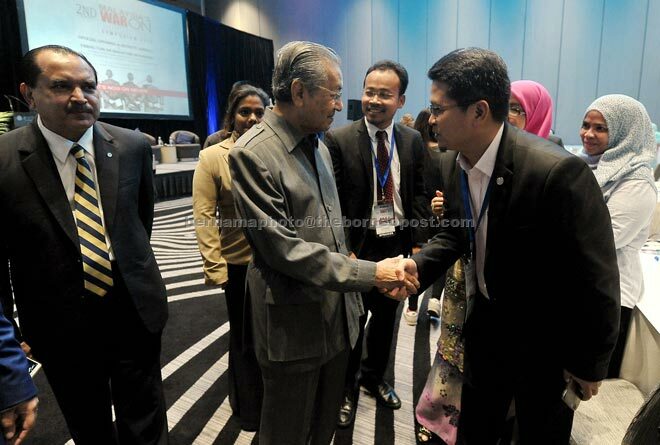 Dr Mahathir said, the possible way to detect corruption at the highest level was to look at the person’s lifestyle. “A lavish lifestyle, such as owning many luxurious cars…someone who is corrupt would not be able to resist spending the money and it’s physical and can be seen,” he said. However, he added, such display of a lavish lifestyle would not be sufficient evidence in court.